← Power tools…holes…they sorta go together. Y’all might recall I installed a new hole a couple weeks ago (here). Finally, we are working in the kitchen and the finish up of the mud/utility rooms. This is the style of the original door trim on both doors in the kitchen, even though the rest of the house has stained/adorned trim. 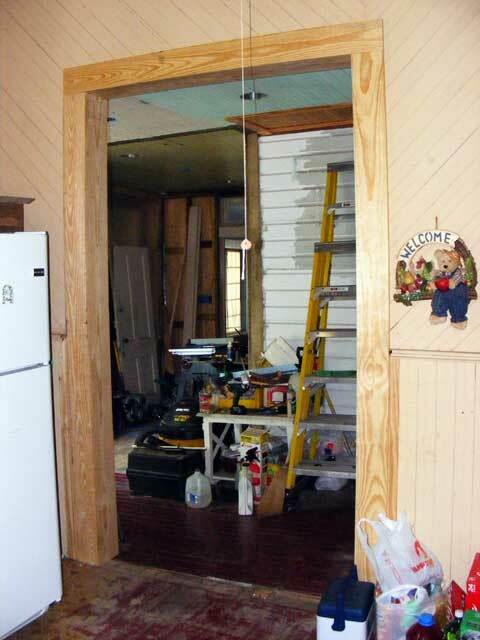 The kitchen was all paint and flat trim, its hint of decor coming with the beadboard walls and ceiling. We do have a plan to “art” it up a bit though. That will come later. Sooon…soon now…I’ll have enough of the carpentry done that we can get rid of the pepto-bismal paint that the entire kitchen is covered in (walls AND ceiling…gah!). A four color paint scheme is coming…(lower beadboard, upper beadboard, ceiling, trim/cabinets). Should be a dramatic change and will be Victorian in attitude if nothing else. Man that’s some solid construction let me guess the door frame is all nice and leveled and square and the house around it makes it look A bit “funny”? Mostly it’s the camera perspective that makes it look funny…door is nice and square.